In the Early Modern Age (16th-17th centuries) the construction of ocean-going ships was paramount to the development of cultural encounters in what became the Age of Discovery and European expansion. In the case of the Iberian Empires, the establishment of new trade routes brought up the need for armed merchantmen, galleons and smaller vessels, placing unprecedented demands on Iberian forests for the supply of construction timber. Forestry and sea power became inextricably linked, creating new geopolitical tensions, alliances and forest regulations. Key questions in this context are: could Iberian forest resources sustain the increasing demand of sound timber, or was the wood imported from elsewhere? If so, how were the trade networks organized? And did the lack of raw material force the technological changes occurred in shipbuilding in the 16th century, or were they a result of exchange between Mediterranean and Atlantic shipbuilding traditions? This project will address these questions through a multidisciplinary and innovative training research program to improve the understanding of our historical past, our cultural heritage, and our knowledge of the use of resources for shipbuilding. The prerequisite for such approach is combining knowledge derived from Humanities and Life Sciences. iii) to develop their transferable skills for future careers in academia or the private sector whilst advancing the research fields through the integration of research tools, development of reference datasets and new discoveries. 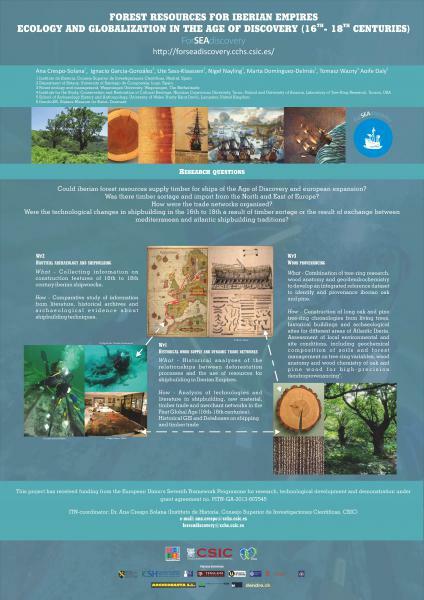 The ForSEAdiscovery project follows the spirit and the text of the UNESCO Convention on the Protection of the Underwater Cultural Heritage especially in the matters detailed in its Annex.